Have you heard of Rainbow Five? Most have not; I had not, until I read Thomas Fleming's masterpiece, The New Dealers' War. I'd say it is one of the most important documents of the 20th Century, and yet to this day it is little known. Such is history; forget its lessons, as Santayana so famously said, and you're condemned to repeat them. The story of Rainbow Five is just such a lesson. Fleming brings more of an Old Right perspective than that of an outright anarchist, but don't let that stop you buying a copy of the book--it's a treasure-trove of insight into how America was dragged into World War Two and how hundreds of thousands of American lives were sacrificed in the interests of government. His research is impeccable and his style, compelling. Before encountering the book, I had already concluded from others such as Hamilton Fish's Tragic Deception and Robert Stinnett's Day of Deceipt that FDR deliberately manipulated the United States into that War when no defensive need existed; possibly to distract public attention from his abject failure to end the Great Depression and almost certainly to bid (successfully) for a much more prominent role for the US Government in world affairs when it was all over. Even as late as December 6th, 1941, the American public wanted no part of it; poll after poll showed huge majorities in favor of letting the rest of the world destroy itself at will, with neither help or hindrance from America. That majority reversed itself 24 hours later, after FDR's master stroke brought the destruction of the Pearl Harbor fleet by agents of the Japanese government, of which my own short summary appears here. In The New Dealers' War, Fleming does not dwell on the way FDR engineered Pearl to make it look like an unprovoked, surprise attack. He doesn't deny that it was a false-flag operation, but apparently feels that even after two thirds of a century, the proof is not so overwhelming as to be taken as fact by a scholar of his repute (9/11 MIHOP theorists, please note: you may have another 60 years to go, before the evidence is hard enough). Instead, Fleming brings out two other themes of the disaster that needlessly took 400,000 American lives: firstly how FDR turned a vicious trick in the West into what he really wanted most, namely involvement in a European war to the East--which I had never previously understood--and secondly, the importance of the slogan "unconditional surrender," which I remember being bandied about when I was a boy and probably repeated myself at the time with bloodthirsty, patriotic, thoughtless gusto. So to the first of these: Rainbow Five. That was the name the Army gave to waging war on Germany , prepared as a contingency plan by then-Major Albert Wedemeyer at the Pentagon in mid-1941. That is SOP for governments; they always have plans up their sleeves for waging war on each other, just in case they see advantage in dusting them off. Wedemeyer's was a businesslike plan and was, of course, very much Top Secret. Relations with the German government were not good-- US military help had been given to Britain for over a year--but there was no state of war, much to FDR's disappointment. That huge popular opposition to involvement was reflected in Congress. The German navy, meanwhile, was under orders not to harass US shipping in the Atlantic , despite the heavy provocation of the military convoys. Hitler at the time did not want to fight the USA until he had dealt with the USSR , in a war he began in mid-1941; two-front wars are a bad idea and he already had the still-undefeated Brits battling him in North Africa and posing a threat to his Northwest. Rainbow Five proposed shipping a 5-million man army to Europe in mid-1943 to attack and conquer the Nazi empire, and specifically explained that the two-year delay was unavoidable because the needed equipment was simply not in place. And it was written, recall, before the Japanese had destroyed most of the Pacific Fleet, which might otherwise have been brought round to help in an Atlantic war. 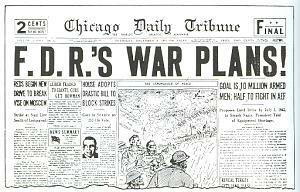 Fleming tells of how Major Wedemeyer arrived at his office on December 4th, 1941 , totally aghast to find a copy of the Chicago Tribune lying on his desk with a published copy of Rainbow Five. The Trib at the time opposed FDR, and it had been leaked by persons unknown--but certainly not Wedemeyer. Fleming reviews the few possible culprits, and concludes "no other explanation fills all the holes in the puzzle as completely as FDR's complicity." But why? While Rainbow Five was under urgent review in Berlin , the Pearl Harbor attack took place, and by December 8th, war had officially started between Germany 's (defensive) ally and her potential enemy. The decision was not hard: to put Russia on hold and wage war at once on an America preoccupied with Japan, with a vigorous Navy-based campaign to put her Atlantic capabilities out of action, and a large reinforcement to his African army to knock out the British there, so forcing an armistice which he repeatedly sought. He badly miscalculated his ability to keep the Soviets quiet, but otherwise that made perfect sense in the radically new circumstances that had emerged in three days flat. Hence on December 11th, the German government declared war on the American one; by the extraordinary cunning of leaking Rainbow Five at the very time he knew the Japanese attack was pending, FDR achieved his objective of joining World War Two--with Germany as his first priority--despite an 85% pre-war popular opposition. And he had done it with both enemies in such a way as to make it seem they were the aggressors! That is statecraft at its very ugliest, and set a standard of malevolence to which even Shrub has not come close (though he does have 13 more months). The other component of Fleming's book that broke new ground for me was the Allies' insistence on "unconditional surrender." This was not just morale-boosting propaganda, it was a policy agreed to first at Casablanca in early 1943, and it was FDR's baby. Churchill, to his credit, was wise enough to count the cost before getting aboard. Arguably, FDR announced the policy to appease Stalin, who was so critical of the US/UK failure to commit to invading France that year that it was feared he would make a separate peace with Germany ; but that does not excuse its rigorous enforcement two years later. Churchill never liked it, but all three government leaders pretended unanimity and sold the concept to their domestic bases. Its importance emerged later in the war, when victory became almost certain. Then--late 1944, say--it would have been feasible to negotiate a peace with Germany , and, a few months later, with Japan too. There was substantial opposition to Hitler within his country and even within his army. Admiral Canaris, head of the German intelligence service, was a case in point. All of these were making serious--and horribly dangerous--attempts to contact the Allies to set up a dialog. The only answer was silence; the policy of unconditional surrender was the reason. Knowing that policy (the Nazi leaders made it very public), even German civilians, who by then had no heart for the war at all, saw no alternative but to fight to the death. The rest is history. Now consider the policy's cost, as Fleming so eloquently counts it: "the Americans lost 418,791 dead and wounded after the breakout from Normandy . . . the British and Canadians . . . another 107,000. If we include Russian and German losses, the total post-D Day dead and wounded approaches 2 million. If we add the number of Jews who were killed in the last year of the war, the figure can easily be doubled. If we add all the dead and wounded since 1943, when unconditional surrender was promulgated, destroying the German resistance's hope of overthrowing Hitler, that figure too could be doubled--to 8 million. Unquestionably, this ultimatum was written in blood." Franklin D Roosevelt was not the biggest mass-murderer in history; Mao, Stalin and Hitler each killed more than he. But he comes quite close; his two most notable achievements provide reliable commentary on the nature of government. Instead of allowing the market to correct itself after the 1929 Wall Street setback, Hoover and (especially) he intervened again and again, so creating massive poverty while raising the FedGov to unprecedented power in the land. Then he deliberately and craftily engaged America in its second most costly war ever in order to raise the Nation to unprecedented power in the world. His success in creating a massive government in a massive nation is universally celebrated to this day in the city where he did it, and I agree; this bloodthirsty megalomaniac is the archetypical government leader. Accordingly, all who agree in deploring the wicked deceptions of Pearl Harbor and Rainbow Five, along with the mindless savagery of the unconditional surrender policy, have no rational alternative but to deplore government itself. Can you imagine the response if FDR had heard of a reliable plan to kill Hitler in 1943? He would have told Hitler. As long as Hitler was in charge no surrender would be allowed and that was exactly what FDR wanted. And Truman was no better. He could have saved tens of thousands of lives by telling the army to stand down on the Pacific island campaign and not dropping the bomb. As if a country with no navy or air force was a threat he would not allow their surrender and extended the war needlessly. Even our air force was against the army's Pacific island plan. Generals just love to play "war" with real lives. The lesson learned: Government creates the worst possible destructive scenarios. So why do most people consider a society without it "unthinkable"? Can it be their critical ability has been short-circuited on this topic?